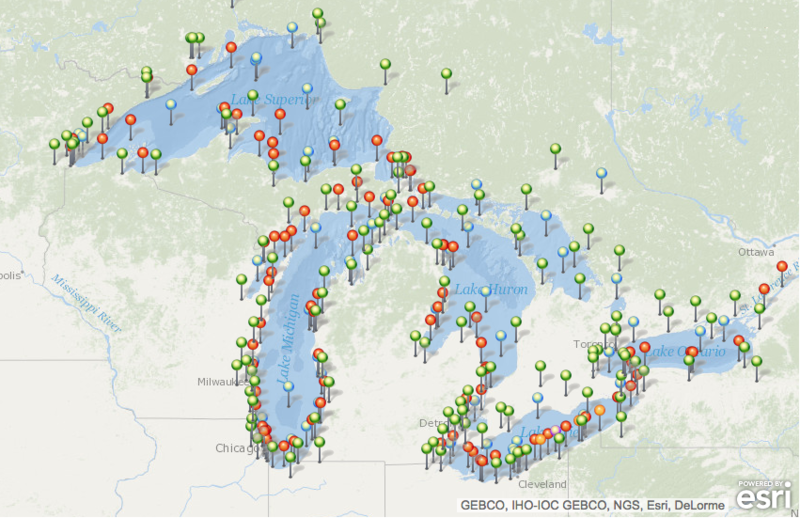 This page contains realtime marine data from Great Lakes buoys, coastal met stations, airports, and ships. The data are transmitted through the NOAAPORT system and are received continuously at NOAA/GLERL via satellite dish. Marine obs include wind speed, wind gust, wind direction, air temperature, dew point, cloud cover, sea level pressure, water temperature, wave height, wave period, and live tracking of Great Lakes ship locations. Note: The map to the left is static and shows all fixed NOAAPORT stations that have reported data over the past two years. To view live data, click on a lake in the map to jump to realtime data for that lake, or click on a data type or an individual station below to jump to realtime obs for that data type or station.